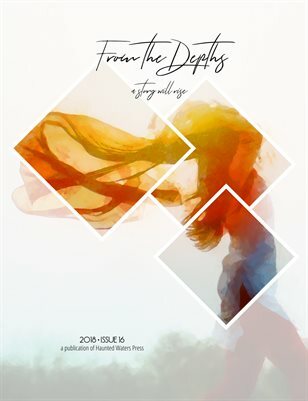 The 2018 issue of From the Depths features fiction and poetry by Cindy Knoebel, Elizabeth P. Buttimer, Sherry Morris, Zack Martin, Elaine Nadal, Timothy Tarkelly, Kindra McDonald, Gail Peck, Claire Scott, Rachel Lauth, Richard Alan Hadley, Jacqueline Rosenbaum, Stephanie Dickinson, Caitlin Plante, Robert Jacoby, Kristina Fahl, Chad Baker, and Robert Garner McBrearty. With Penny Fiction by Jason Stanaland, Cheryl A. Montgomery, James Duncan, Alistair Herbert, Chelsea McGlynn, Hannah Whiteoak, Tiffany Leong, Salvatore J. Lo Monaco, Ace Moore, Sylvia Santiago, Shermie Rayne, Shelly Ironside, Jenny Wong, Riaz Jahangir, Rachel Cochran, Jeremiah S. Perkins, Brenda Bellinger, Scott Matthew Mahoney, Charles Gerard, Brie Radke, and Jimmy Kaufholz. Cover art inspired by the 2018 Haunted Waters Press Poetry Open winning entry "Ars Poetic How to Wear a Scarf" by Elizabeth P. Buttimer. Enjoy!